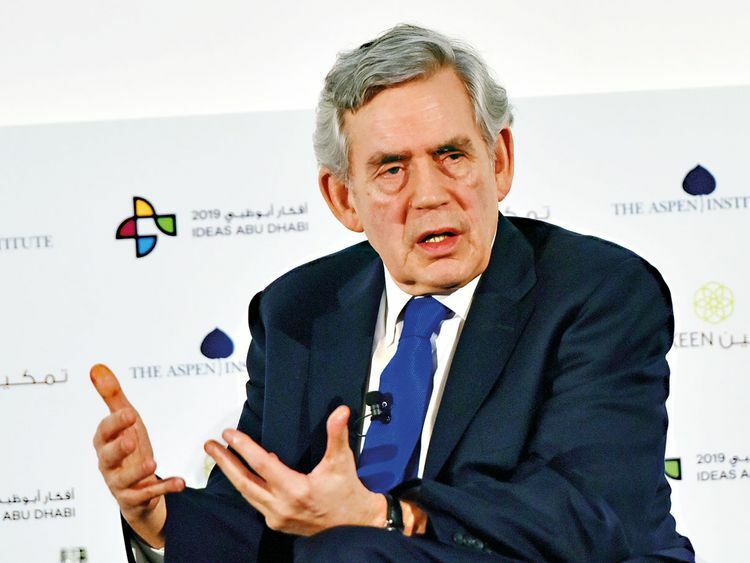 Abu Dhabi: Many international organisations created in the 1940s are now outdated, and fail to serve the interests of a changing world order, Gordon Brown, former British prime minister, said in the capital on Wednesday. Addressing the audience at the Ideas Abu Dhabi Forum at New York University Abu Dhabi, Brown urged reforms to the International Monetary Fund, the World Bank and even the G20, which he said he was involved in creating. He also called for a move away from the protectionism that today dominates international discourse. “For 30 years, Russia and America fought each other in bitter space wars to get to the moon. Then in 1980s and 1990s, they realised that the only way to make progress in space was to work together, hence the International Space Station (ISS), [with so many] nations working together. It is so interdependent that America cannot carry out a launch without Russian technology, and Russia cannot man the ISS without American technology,” Brown said. “If we can achieve [international cooperation] in the ISS, an area that was [once so confrontational] and volatile, surely we can find better ways to cooperate here [on Earth],” he added. The British politician who headed the United Kingdom between 2007 and 2010 was speaking on the first day of the forum as part of a session about the transformations in the world economy. Praising the achievements of the UAE, which he said has developed a space programme in a very short span, he highlighted that the growing middle class around the world will drive growth in the next 25 years. “[The size of the middle class] will double in the next 25 years and the increase in consumer spending, home ownership and travel will create major opportunities. The way forward is what I call responsible cooperation, a society of states that shows we achieve more by cooperating together,” he urged. The reforms he called for would focus the World Bank on dealing with the problems of inequality, and on providing humanitarian aid to assist the 60 million displaced peoples who are the biggest drivers of poverty today. “The G20 that I was involved in creating was always an interim body that excluded 170 countries. If it is going to continue, it has to bring them in for consultation and cooperation and focus on how to prevent financial instability and secure economic growth,” Brown said. Brown stressed that protectionist and isolationist policies are “totally counterproductive”, yet the world has been slow to argue that they do not work. “If you cut off imports, you will cut off exports because so much of your exports are dependent on imported components. [Moreover], even the most powerful nations of the world cannot deal with some of these problems on their own, like terrorism and illicit finance,” he said. The politician, who now serves as the United Nations Special Envoy for Global Education, also urged for inclusive educational opportunities for all to counter these international concerns.